I’ve been in a bit of a rush lately to finish some things up because I knew that March would be a deluge of new beginnings, spurred largely by a couple new -Alongs I’ve helped organize. Of course that means that once again I’ve got a stack of FOs that I need to share with you — a fact about which I’m definitely not complaining. Partly because some of them are still drying and partly because none of them have proper finished photos taken, I thought I’d tell you about the new things that have landed on my needles and wheel over the last couple of days. 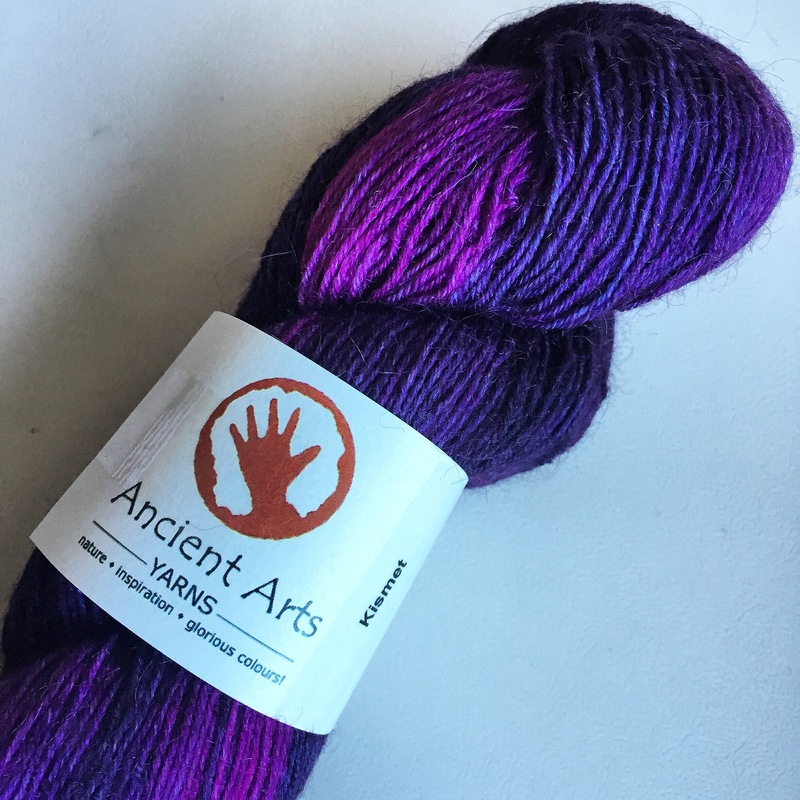 And as I’m to review the yarn, Reinvent by Ancient Arts Fibre Crafts, I was anxious to get it on my needles without too much delay. I did take my time settling on a pattern and then, upon finishing up some socks I’d been working on for my MIL this weekend, I got straight to work. I settled on Artarktis by Janina Kallio and I’m extremely happy with the selection. I’m kind of at a point in the project where a really good quality photo is not all that easy to get, but rest assured when I say the yarn & pattern are playing beautifully together. I’m finding the combination almost irresistible as the yarn is nice and crisp in my hands and the colorway, “Kismet” is so very lush. When combined with the almost popcorn knitting of the pattern, setting it down has been almost too much for me. But that said, March 1st has marked the beginning of two awesome new -Alongs I’ve helped to plan. I’ve been a tiny bit nervous that I may have bitten off more than I can chew, but I’m nothing if not willing to go for it when it comes to knitting & spinning. Even when time challenged, they are such an enjoyable release for me. This morning I got up early and the kiddos actually slept in, so I managed to get started on my two new projects for the two new -Alongs. What a fun way to start the day! 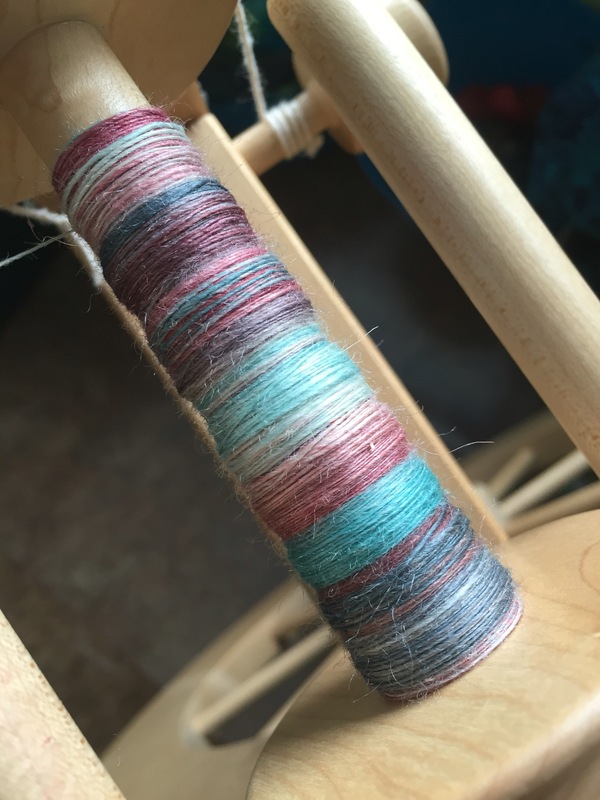 First, on my wheel, I’m participating in Three Waters Farm‘s Unexpected Combo Spin-Along this month. 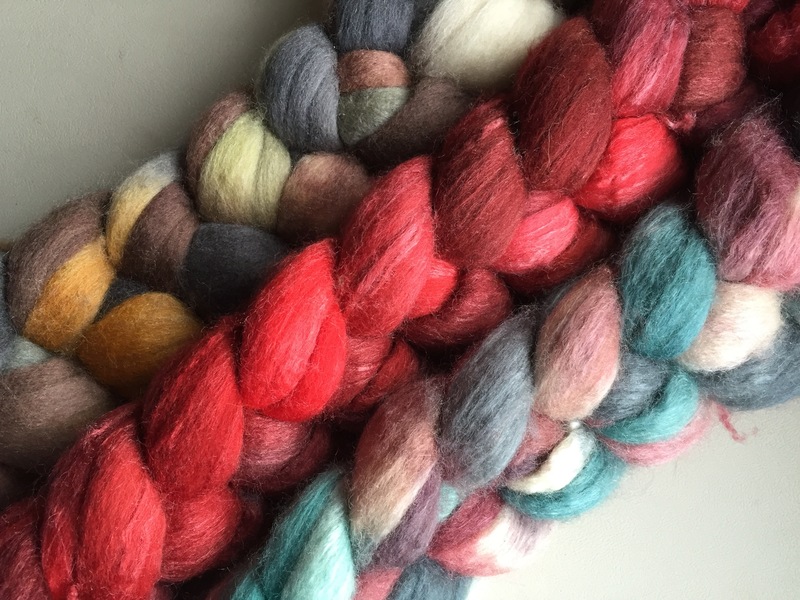 Basically, it’s a little challenge to take some of the beautiful Three Waters Farm colors and mix them up. I will say that helping to see color combinations is something Mary Ann from Three Waters Farm does phenomenally well and the group is equally as skilled. I’ve always been a little challenged in this department so I’m staying somewhat tame, but I feel like I’m making up for that in sheer ounces of fiber. I’ll be taking my braids selected this quarter for my 1+1+1 project and spinning them together. Usually for me 2 – 4oz braids of fiber is the max I do for a project, so doing 3 feels like an enormous (kind of daunting) undertaking. I’m positive it’ll be worth it though. It’s kind of an evolving plan, but right now I think I’m just going to spin all three separately and then ply them together in a traditional 3-ply. And early this morning, I got my start. I’m beginning this project with ‘Dirty Girl Redux” on a BFL + Silk base. It’s been a long enough time since I’ve spun with a silk blend that I’m expecting a little more inconsistency and a little slower spin time on these. This little bit I got started, however, has been a pure joy — regardless of how it looks or how long it took. On my needles, I got a start on the Brioche-Along taking place in the Friends of Knitting Sarah Ravelry Group. It’s just an informal, intimate little group working on brioche. 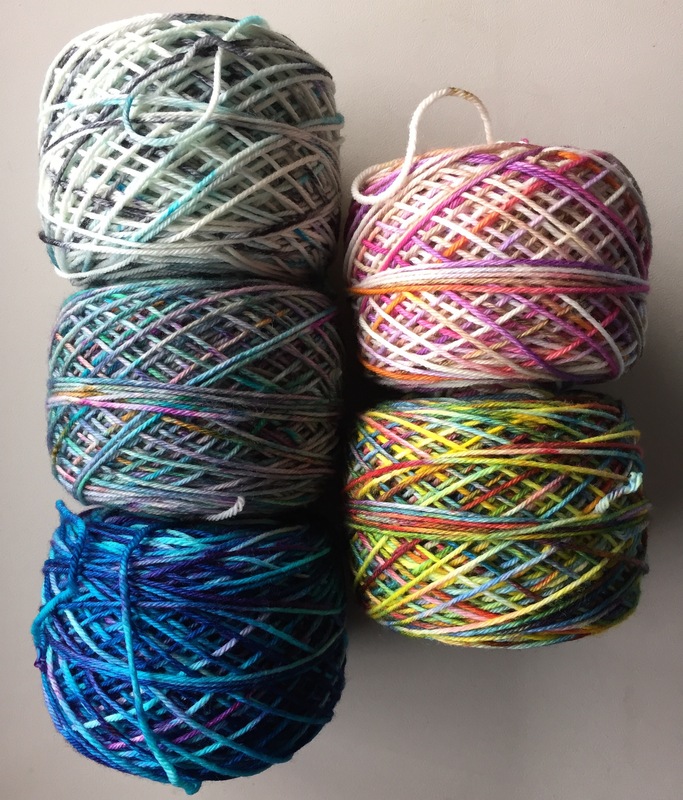 Yarn, pattern, everything is the individual’s choice, we’re just knitting brioche together for support where needed and the general fun involved with working the same types of projects together. 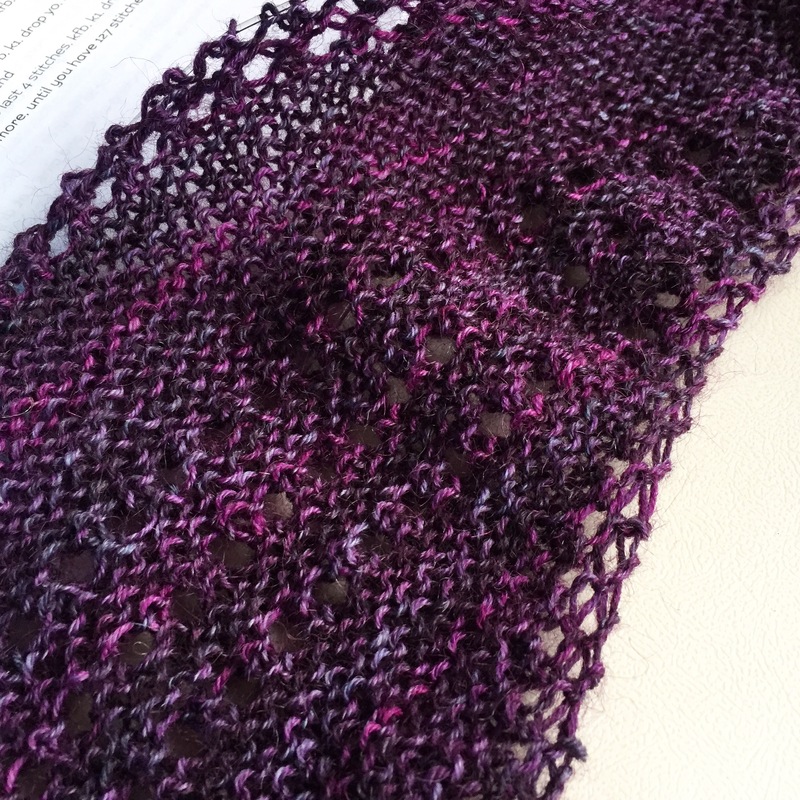 I’m working on Stephen West’s Askews Me Shawl. I was 100% inspired to knit this last summer when Renee from Spun Right Round was working on a scrappy version with her yarn. I had some of the same yarn in my stash (and may have added a couple skeins with this shawl in mind) and set it aside for this project. And there it sat until a few weeks ago when a couple people in the 1+1+1 Project mentioned wanting to try their hands at brioche. Long story short, we opened up the Brioche-Along. I think I re-knit the set-up rows at least 6-10 times to get it in my hands. By this point, my kiddos were also up and about so getting through the whole section without interruption/losing my place took some doing. A friend in the TWF ravelry group recommended these erasable highlighters a few weeks ago and — holy moly — did they ever save my life. I’d rank them up there with highlighter tape for their usefulness. They’re definitely worth trying if you haven’t yet. Found the point of total addiction. I’m already trying to figure how if I can make this shawl a little bigger. I think I’m getting ahead of myself, but it’s seriously just that fun and the fabric is just so squishy. And it’s only going to get better as I move into the more high contrast yarn combinations. Oh, I can’t wait! As you can probably understand, I’m going to stop gushing for now and get back to knitting and spinning. These new beginnings are just too good to set down! Which one?! I have to admit I now have 2 shawls I can’t put down! They are both highly addictive! It’s very fun! I really wanted a pattern that would be a versatile weight. I have made a lot of shawls, but don’t have a ton of warmer weather friendly ones. This one should be great for the warmer months! Well, when you get to it, you’ll love it. Now that I’m past the set-up rows, I’m having major problems putting it down. It’s such potato chip knitting! 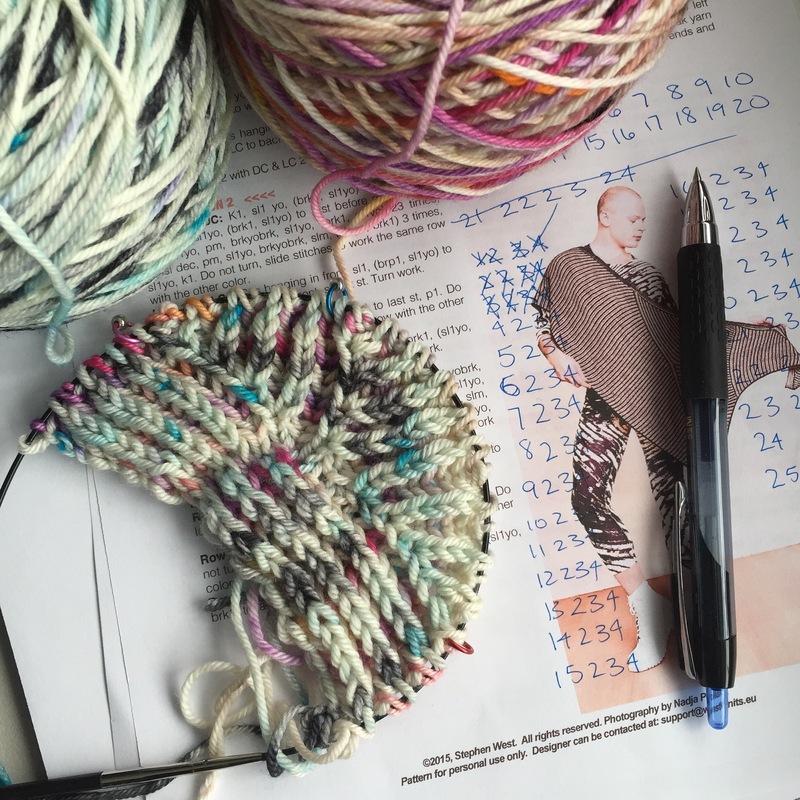 wow – so much wonderful knitting and spinning happening at your house! Love all that yarn. and I look forward to following the brioche progress. I think I’m in serious danger of just whipping through the brioche. I kind of haven’t put it down in two days – lol! I just added a new color (hopefully at a good place in the pattern…), too, so now I just want to knit away to see how it looks! nothing wrong with that! I love when I have a pattern that makes me just sit and knit it until it is done. I once made a sweater in a weekend – three days, cast on to walk out the door (it could have used blocking, I suppose!) because it was so nice and easy to knit. So I get it, when a pattern is right, it is right! Lovely! 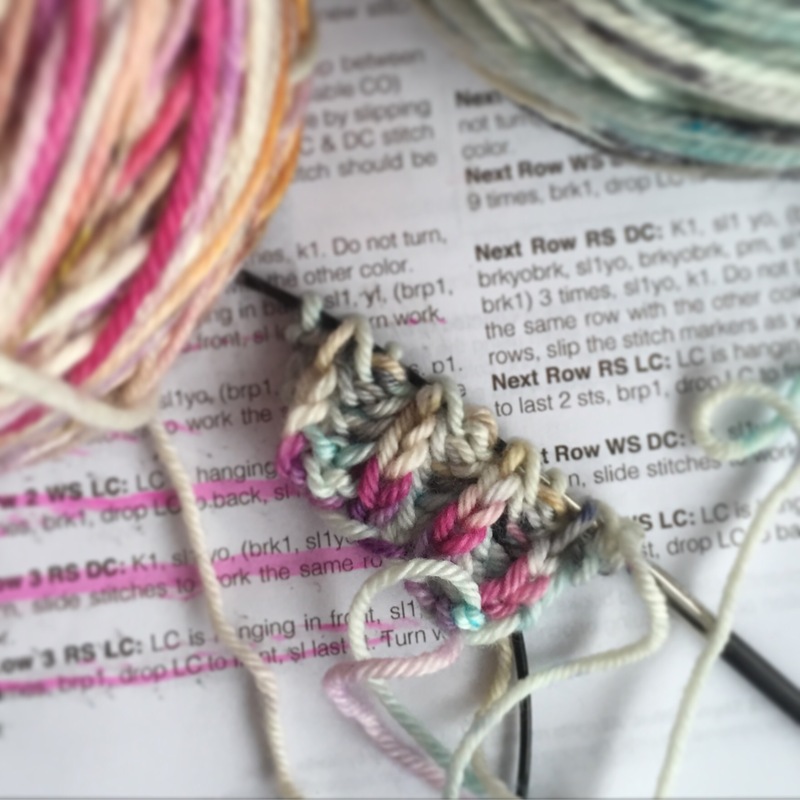 I haven’t given brioche a try yet but your color combo is going to be so fun. Brioche I actually find to be a lot like knitting stockinette once you get in the groove of your pattern. There’s more to it, but it definitely has a similar feel for me. It is fun, isn’t it?! I’m not usually so adventurous in choosing my own color combinations, but this one is giving me a lot of courage for the future.